I hope you are enjoying the holiday release as much as I am. Today I took a stab and creating a watercolor scene with the gorgeous "Christmas Trees" set of 6 stamps just released. I started by masking off the bottom of the watercolor card stock by tearing painters tape and adhering it on an angle. I then applied water and dropped blues, greens, yellows, and grays then allowed that to dry. I like to start light, then build up the colors. 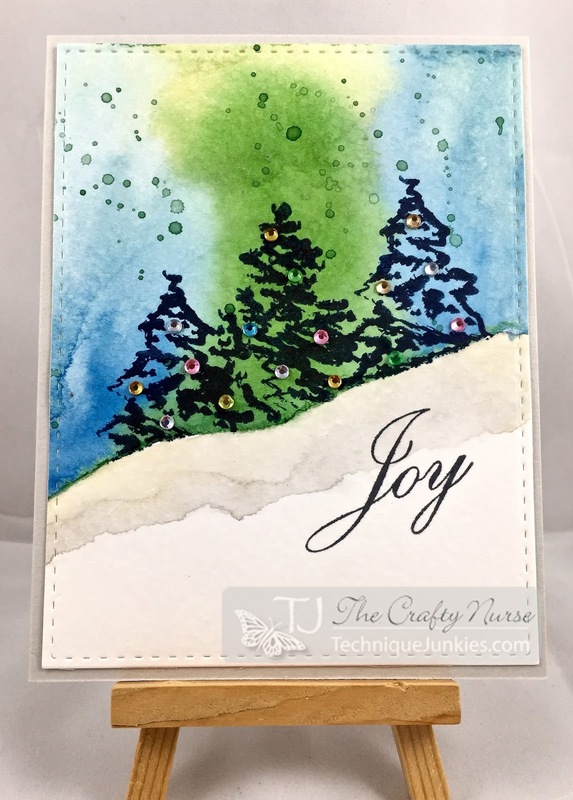 Once the background was created I stamped two of the Christmas Tree stamps using Staz-on Midnight Blue. Using a waterproof ink allows you to go back and add deeper colors. I then removed the tape, applied gray to create snow and stamped the "Joy" sentiment, also in this holiday release. To finish, I added some gems and splattered the top portion of the card with green watercolor. If you haven't had a chance to check out the holiday stamps, please stop by the Technique Junkies website so you don't miss the new goodies.